EH on a belay ledge, Fisher Towers, UT. McCallister photo. I would like to thank everyone who has purchased my books and written to me from across the United States, Canada, Mexico, Brazil, Argentina, Guatemala, Venezuela, Chile, Ecuador, Peru, Great Britian, Ireland, Germany, France, Luxembourg, Switzerland, Austria, Italy, Malta, Crete, Spain, Portugal, Croatia, Greece, Israel, Hungary, Turkey, Norway, Denmark, Sweden, Lithuania, Iceland, Scotland, Belgium, Czech Republic, Slovenia, Russia, Uzbekistan, Poland, Romania, Ukraine, Netherlands, South Africa, Japan, China, Singapore, Iran, Pakistan, India, Taiwan, Hong Kong, Bahamas, Philippines, Indonesia, Korea, Thailand, New Zealand, and Australia. Below is just a small selection of feedback supporting my TFC philosophy–I hope you’ll find them as inspiring as I do! Congratulations on your new books, one of which is on my nightstand right now! I not only appreciate the technical info, but also the positive way you couch everything for all climbers of all abilities and the respect for the visionaries of the past (Gill, Gullich, Skinner, etc.). Thank you heaps for the great service! Your books are gold! Thanks so much for doing what you do. I am constantly learning new things through your website…and your podcasts are AWESOME! Thanks for writing Training for Climbing–it´s amazing! Greetings from a passionate spanish climber! I’ve just read your book Conditioning for Climbing. I must say it basically covers all the essential knowledge every climber will need. Excellent work! I am a physical educator, climber, and climbing researcher, and I found your books to be a safe harbor. Great info and a professional approach make them the best resource of information. Thanks you very much! Your book, Conditioning for Climbers, is a winner. I received it on Monday, have skimmed the entire volume, read several chapters, and will read the rest in the next few days. Thank you for taking the time to share your knowledge. Thank you for all the time and energy spent researching training. I purchased Training for Climbing when it first came out and within a year I was climbing 2 grades harder. We call your book the “clible”! Having never climbed, at age 26 I dove into climbing and thanks to your book, Training for Climbing, I lost 15 lbs and got myself to 5.10’s in 4 short months. I sincerely appreciate the specific attention you give to mental training and what I like to call ‘enlightened climbing’. Your writing is beautifully clear. It’s been nearly 3 years since I was in contact with you, but I came across my copy of Training for Climbing just the other day, and I realised it played a rather pivotal role in my climbing life. Three years ago I emailed you asking for advice, which you very kindly gave, and it served as inspiration for me. Thanks again! Your new book is fantastic! Excellent quality as always, and packed with great information for all levels. The training knowledge I have gained from all your books has allowed me to get back into the sport after time off and maximized my training efforts with two kids and a 60+ week job. I appreciate all you have contributed to the sport. Hey Eric, Just wanted to say thanks for your book Training for Climbing. I have read it more than once and every time I find some new valuable info for improving my climbing. I am reading your book, training for climbers and I am absolutely fascinated about life and climbing, Thank you for putting the book together its changing my life philosophy already. Thanks for all the great training advice in How to Climb 5.12. After being a mediocre 5.10 climber for years I received your book as a gift, applied your training techniques, and transformed into a solid 5.11+ climber. I am reading your book and so far I have found it absolutely amazing! Many of the concepts of strength training are new to me even though I’ve been climbing for 15 years. Thanks for all you do for the sport, Eric. I have all your books and read them again monthly!! I have been going through your podcasts (again) and I just wanted to say thank you. So much of your advice; the mental training material has been especially helpful in my climbing and the rest of my life. Positive thinking is indeed a very powerful force. Certainly reading more about your friend the late great Todd Skinner, and how he lived his life, has helped me change the way I look at things as well. Thanks again. I just wanted to tell you how happy it was to run into you at the crag last Saturday! I felt inspired after talking to you, and your compliments really upped my confidence. Anyway, I just wanted to send you a quick note to say thank you! Hopefully I’ll see you out again sometime – my husband was jealous I got to meet you and he didn’t! Take care! Hello Eric, First and foremost I just wanted to tell you that I am reading both How to Climb 5.12 and Training for Climbing, and am extremely impressed with simplicity and effectiveness of your training principles. In just few weeks of adding a 15lb weight to my pull-up training I went from barely doing 4 pull-ups to going strong 15 times (at body weight). I guess I am a proof the HIT training really works! This is a note to say that last night at a local western Montana crag, I redpointed my first 5.12! It’s a vertical, highly technical limestone line of about 85 feet called Devil & Me (5.12b). I should add that I’m 48 years old and four years ago, after a 10-year hiatus from climbing, I decided to see how far I could get in the ratings, having topped out my first time around at about 11a. Your books have been instrumental in getting me to this point. So, I owe your good work and words a big thanks! With a methodical, process-oriented approach (which I completely lacked in my 20s even though I climbed all the time) I feel the sky is the limit, even at middle age. I recently bought the book Training for Climbing, and I think it’s an excellent book. Thank you, Eric! Hi Eric, About a year ago a friend who is a much better climber than me pointed out that I should really be climbing a lot harder than I was–I had just started doing 5.10b trad but was still only at about 5.10a for sport climbing, mainly from being particularly weak on overhanging routes. So 6 months ago I dug out your How to Climb 5.12 book, followed your training and diet advice, did the antagonistic muscle exercises you recommend, and just did my first 5.12a this weekend! Thanks for your good training advice. Let me begin by thanking you for all the help that you have given me over the years. Between your TFC book, Mental Wings CD, Masters of Rock CD, podcasts, and training articles; I believe that I have attempted to absorb a bit of everything that you have offered. In all honesty, I have been in kind of a funk lately for a variety of reasons and have very much appreciated your recent articles about motivation. Eric, I purchased a copy of “Training for Climbing” two days ago and I already think its brilliant. I’ve read it through once so far and I’m amazed at the extra information that you have added on top of the chapters in “How to Climb 5.12”. Today I went back up to Norton Summit to have another go at my project. I followed your nutrition recommendations closely: Eating a good breakfast, drinking plenty of water, snacking on some medium GI food, and continual drinking whilst climbing. And, I consumed a high GI drink and some protein immediately after climbing. I also used the visualization technique you described and found that I was able to make an extra four moves on top of my previous efforts. I also noticed that I was considerably less pumped after each attempt. Even though I still haven’t completed the climb I left the crag feeling much more satisfied than usual and more confident about my climbing. I guess this is just a really long email to say THANKS! I love your web site and your books. They have helped me immensely. Thanks to your advice, I just had the best climbing trip of my life. I onsighted a ton of great routes and redpointed my first 11d in Smith Rock! Thanks for all the help! Eric, I really enjoyed reading Training For Climbing. It is a very well written book! Thanks for being such an active part in continuing education for training. I read a quote from your training book and consequently bought it. This book has changed my whole attitude in climbing and life due to your mental training chapter. Just wanted to say thank you! This is just a quick thank you for the massive improvements your book has bought me in climbing. 14 months ago I started climbing, and dislocated my left shoulder, pretty badly, within the first month. Two physiotherapists told me there was no way I’d ever climb again without dual shoulder reconstructions (my other shoulder was dodgy too). A local gun climber, Christina Bedard turned me on to your book, telling me she’d been using your techniques to overcome the same injury. And so a year later and a lot of weight sessions later I’m climbing hard and fitter than ever before. I’ve gone from a fragile bumbly to climbing 20-22 (about 5.10b-c in your money), bouldering V4 in just under 12 months and never been happier. My shoulders feel incredible and my confidence in their stability grows every day. Thank you again, and I hope the rock is good to you. I have your climbing book Training for Climbing, and I think it is great! Hi Eric, I thought I’d send a quick note to let you know that your program worked for me. I bought your book How To Climb 5.12 in the fall, completed one full ten-week cycle with a partner this winter, and followed this with less formal endurance and HIT sessions interspersed with many routes. Last week I red-pointed my first 12a at Chek near Squamish! Thanks! Thanks for your book How to Climb 5.12. It has really made a world of difference in so many ways, physically and mentally. I am not an overly demonstrative person, but I can’t stop raving about and reading it. It’s falling apart it’s been so well used. 🙂 Cheers! Many thanks for the training tips Eric. Also I must pass on that the H.I.T Strips are a fantastic training tool! Myself and brother have been cycling on and off them for a while and have found them very beneficial. Once again many thanks and keep on climbing! Hi Eric;I read your book Training for Climbing. I think is the best book in the field. Just wanted to say how much I’ve learned from your two earlier books (How To Climb 5.12 and Flash Training). In the past 2 months I’ve moved into the 5.12 realm, redpointing 4 different ones (all on different rock types: steep/endurance, steep but bouldery, sustained face, and bouldery face). I think one of the most useful things that I learned from your book was the progress pyramid in the back. I went through the 11’s, building a solid base on different types of routes. While I probably could have rushed my progress into the 5.12 range by projecting 1 route, I think it would have been detrimental in the long run as I would have lacked a foundation on which to build upon. Now I need to purchase Training For Climbing and get even more serious about training! I bought your books, How to Climb 5.12 and Flash Training after being inspired to start rock climbing. I read them cover to cover and have since looked back on them innumerable time as references. They were especially helpful to me in avoiding injury, diagnosing injury and curing it, and getting stronger. The year I began climbing and bought your books I managed to lead a 5.8. That winter I joined a gym and started climbing there two or three days a week. The next summer I began projecting routes at Rumney…first a 12a, then a 12a/b, then a 12c, then a 12d, two 13as, a 13b/c, and then a 13d. Some of these routes took me ten climbing days or in one case even more to redpoint. The following winter I began bouldering. I climbed three V10s. I did another couple 13a/b climbs, worked a 13d unsuccessfully five days (I’ll get it yet) and a couple more 12ds. My big project, which took me 19 days of effort, was a 5.14b. I tried it seven days in the spring and then finished it in the fall, working other stuff over the summer. It was great fun and I just sent it yesterday. I thank you for the advice your books provided that kept me in the high country (away from plateaus) on my journey to 5.14. Subject: Kudos from an ex. science guy. I just wanted to pop an email over to you because everything of yours that I’ve seen is well researched, and follows sound pricinples. Your applications to the world of climbing has been inspirational to me since I found myself having a hard time applying what I had learned in school studying Exercise Science, and as a scholrshiped NCAA Div. I Decathlete, to my new passion and pass time. Keep up the good work! I want to tell you that Training for Climbing is clearly the best and most comprehensive book on climbing training methodology I have ever read. In particular, the chapters on mental training and skills/strategy training have inspired me and have given me extremely valuable insights for my future workouts. Your explanations have also led me to finally understand why parts of my previous training schedule did not yield the desired results in the past. Thanks for such a great work! Eric, Just wanted to say thanks for writing Training for Climbing. Since I started reading it and training, I have improved one letter grade every two weeks. I am having a great time doing the strength training exercises and just enjoying the process of climbing with a different mentality. Hi Eric; I’ve just finished reading Training for Climbing–great work! Over the last 14 years I have studied climbing and to date your new book is by far the most accessible to “intermediate” climbers. Keep up the fine work! I own both Training for Climbing and Flash Training, and it might warm your heart to know that the books accompanied me to Iraq last year–some of the young Marines training with me got to know your “Frenchies” and the like! Eric, your easy-to-read style and obvious technical knowledge has finally penetrated the rock hard dome of this Marine! You have a big fan in me. I will tune into your website regularly and will undoubtedly gain from your continued excellence. Thanks much and Semper Fidelis. I have been climbing for about 1 year and reached a plateau around two months ago. At this time I was stuck in my local gym redpointing australian grade 21 with the occasional onsight. This was really frustrating me and made me consider quitting as I thought I couldnt get any better. We have a fairly small climbing community here in Western Australia, so its hard to find experienced climbers who will devote time to helping others. It was around this time that I found your website and bought your book How to climb 5.12. After following your training advice for around one month (increasing finger and forearm strength by campusing and fingerboards and bouldering to hone my gripping actions) my climbing skill as dramatically altered for the better. In my first performance day at the gym after 1 month of training I was able to onsight 2 australian grade 23 and am very close to redpointing my first 24. I have also had success out doors, pulling down climbs of grade 22/23 that were completely unworkable two months ago. A short while ago these were fantasy climbs I could not have dreamed of achieving. These results have really pumped me up and encouraged me to aim for pulling down some really hard climbs. This would not have been possible without the help of your books and website and I am eagerly awaiting the arrival of Training for Climbing in our climbing bookstore. 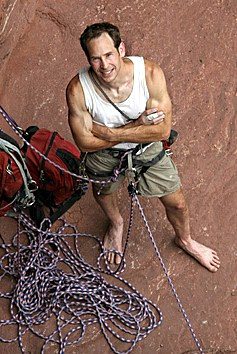 Thank you for rekindling my passion for rock climbing and putting the unreachable within my reach. I just wanted thank you for all the great information supplied in your How to Climb 5.12 book. I read it last winter and followed many of your training tips. I’ve been climbing off and on for about 6 or 7 years, but I’ve never really been more than a 5.10 climber. By this time last year my hardest redpoint was 5.11a. Anyway, a few months ago I started your HIT training and 2 weeks ago I sent a 5.12b on my 4th try. I can’t wait to read your next book! I read your books How To Climb 5.12 and Flash Training in January `02 and I have progressed from climbing 5.10a to onsighting 5.11a and redpointing 11d in under six months! YES, your books work, and YES, belief gives birth to reality!! Thank you for sharing your knowledge with us! I very much enjoyed your book How To Climb 5.12 and have culled many useful techniques and tips from it. Using visualization and some of your training advice, I have gone from a sloppy 5.9/5.10 climber to onsighting up to 10d and redpointing up 11b! Thanks a bunch! Your book is awesome! Shortly after I got your book I started resting way more and doing the 4-3-2-1 training program. I saw rapid improvement and two months later I done a 5.11d in the gym and yesterday (7th April) I sent a 5.12a on my 7th atempt! Thanks heaps for the advice. I think that your approach to the subject is a fantastic one indeed. Whilst reading through the article on your Mental Wings strategies, I realized that I have this information circling me all day everyday but there was always something missing. Now I have realized that it sometimes takes the efforts of people like yourself to display them in order for us to complete our journeys. Many thanks! You will be pleased to know that your book, Flash Training, along with the current HIT training article on the Net have encouraged me (and a few friends) to try and gain a little more strength in sensible ways. Some of the pathways spoken of show their usefulness at different times. It is nice to see people encouraging climbing for fun, not grades. I bought How To Climb 5.12 about 18 months ago when I was only climbing French 6a (5.10b). This Sunday I redpointed “Pulf”, my first 7a+/5.12a, at a crag named Drapel in Switzerland. Thank You! I’ve been climbing seriously for about a year now and I read How to climb 5.12 last spring when my hardest lead was a 10a. After a winter in the gym, using some of your training tips, my first day out for the spring, three weeks ago, saw me redpoint Things as They Are Now (12a, Rumney, NH), my first 5.12, on my 3rd try. The stuff in the book really helped me out and gave me a lot of confidence. Thanks. I recently purchased your book How To Climb 5.12. I must say the book is the best ever! I can’t wait to read Flash Training. I started climbing 6 years ago and have never had a passion for a sport like I do for climbing. After running a marathon a few years ago my kids asked me what I was going to do next–I said “I was going to climb a 5.12 by my 40th birthday.” My hardest redpoint to date was 5.11a. My wife bought me your book How To Climb 5.12 and I read it a few times. I made some adjustments to my home wall, begin some HIT workouts and started using your 4-3-2-1 training schedule. In a few months I redpointed 5.11d, but my birthday was not far off. I started working a route in Big Cottonwood Canyon called “Big in Japan” (5.12b). I drew a topo and stated visualizing my ascent. After working the route on five different days, I could do it with just one fall. I rested two days and took my whole family (Zach 16, Malissa 15, Jackson 9, and Kaitlynn 9 mo.) to watch the old man celebrate his big day. After a few warm-up routes, my wife Lynne gave me a belay–I fell at the crux. After a 45-minute rest, I nailed it! Thanks so much for your great book. It assisted me in achieving a goal that I’ll even admit seemed a little too far out there. Most of all, my kids think it’s way rad old dad did a 5.12 on his 40th birthday. I’m not stopping there, of course! Finally I have found someone who is willing to offer very detail information on training for climbing. In Australia, it’s very “closed shop” on how to train…people either don’t know or don’t want to share the goods on how to climb harder. Well, I’m glad we have the Internet–thanks for your website and the books. Keep up the good work. I just finished reading your book. There is something to be said about getting to the point–which you do very well–I read you book in half the time it took to read the other training book I own, and yours contains much more usable and practical information. Personally, the section on mental training hit home. Physically, 5.12 is not that hard of a grade for me, but mentally it requires a Herculean effort. I think you did a great job, and I recommend the book to others. Thank you, Mr. Horst for helping me achieve my first 5.12a/7a+ just a few days ago…thanks to your influence through the innovative book, How To Climb 5.12! I have read your book How To Climb 5.12 and I found it very useful. I’ve been climbing for about five years and am making decent progress… I’m now breaking into 5.12 sport and 5.10 trad. Thank you. This message is long overdue. My wife and I contacted you about 6 months ago after we puchased your HIT strip training system. Needless to say, we have enjoyed them tremendously…or should I say we enjoyed the results! First a little history: Kristen and I started climbing March 23, 2000, and our first climb was a 5.6 75-foot toprope. I’ll never forget the burn I got on that…forearms screaming, I was proud that both of us made it to the top without falling off. Two months later I pumped out my first 5.10, then it was back to easier stuff to learn to lead. Two months later I lead my first trad 5.10! My wife followed right behind me and completed the same climbs shortly there after. Anyway, to make a long story short, after 10 months of climbing I redpointed a 5.12b/c, and Kristen pumped out an 5.11d! We entered our first competition a couple weeks ago–Kristen came in 3rd place Women, and I won overall. We’re saying all this to thank you and let you know that there are a lot more people interested in the HIT strips now! Of course, everyone at the gym now asks me what I do to workout. Thanks for everything, and congrats on the latest member of your family. I am writing to let you know that having studied How To Climb 5.12, I am impressed with the quality on your advice and your willingness to debunk myths about what makes climbers stronger. I look forward to onsighting my first 7a+ at the end of my next training cycle! Recently I bought your book Flash Training. Congratulations on a really great piece of work! It is excellent. As a 50 year old weekend warrior, I wish I was 21 again so I could hang out at the crags all over again knowing what I now know! Well, I am attempting to get to Everest next year to continue my Seven Summits project… Thanks for your help! Just a quick one. I loved your book How To Climb 5.12 and I have persuaded my local gym to build a special bouldering wall just for your HIT Workouts (and the HIT Strips). Thanks from New Zealand! I have read both your books and they are great. I’m well on my way to climbing 5.12 and I’m stronger than ever. The sections on finger pulley injuries helped me identify a partial tendon tear in my forearm. I stopped climbing right away and it probably saved me a trip to the OR. Thanks! The main reason I’m writing is to thank you for, I think, saving my climbing career. I am 41 and have been training a long time, but naggin elbow tendonitis has always followed me. To make a long story short, your emphasis on reverse wrist curls has had a huge impact on my training schedule and has all but eliminated my elbow pain. I had read your suggestions many times, but only tried it as a last ditch effort. My first set felt like a healing balm was being applied. I was amazed! I hope to shortly be able to top my best efforts (thanks to your articles and books I have onsight 5.12b). If you are ever in Fort Collins, I owe you a beer. Thank you for your two books. They have greatly improved my climbing ability and motivation. I have increased my grades from mid teens (5.8/5.9) to my recent redpoint of a 25 (5.11d/5/12a). The best parts of both books was the mental training chapters. Your visualization and focus exercises are a regular part of my routine, to the dismay of most of my fellow climbers–they don’t like me being overly optimistic! Once again thanks, my climbing ability owes you. I recently purchased your book How To Climb 5.12. It is an outstanding reference to anyone who wants to get better quick. The first time I tried some of the ideas in your book I noticed an improvement. Your book helped me onsight my hardest climb to date, a 5.11d. Thank you! What a great book you write! Both Flash Training and How To Climb 5.12 pointed out many things I was thinking about but never could put into words. Your HIT workout definitely gave me much more strength–I think it’s a really important development for training for climbing. Thank you very much for you great work for climbing, Eric! Your book how to climb 5.12 gave me a burst of enthusiasm when I read it 1 year ago. I am a trad kind of climber who likes to boulder sometimes, sport climb and aid and rope solo. I lead 5.10+s trad, and onsighted 11b sport. Now I just climbed successfully this V4 problem I?ve always tried climbing when passing by at the Gunks. (on the boulder on carriage road not far from High Exposure) I was totally surprised and extatic! Then I did it again with relative ease. It was so good to see the progress I made in climbing! I had to tell you. Thank you for all your enthusiasm, good books and all.